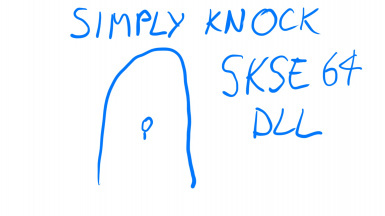 LawrenceFB changed some attributes to Simply Knock SKSE64 DLL: File 'Simply Knock SE SKSE64 2.0.11 DLL' description changed. LawrenceFB changed some attributes to Simply Knock SKSE64 DLL: File 'SimplyKnockSE_SKSE64_2.0.15_DLL' description changed. LawrenceFB changed some attributes to Simply Knock SKSE64 DLL: File 'SimplyKnockSE_SKSE64_2.0.11_DLL_EXPERIMENTAL' changed to 'Simply Knock SE SKSE64 2.0.11 DLL'. ; File 'Simply Knock SE SKSE64 2.0.11 DLL' description changed. LawrenceFB changed some attributes to Simply Knock SKSE64 DLL: File 'SimplyKnockSE_SKSE64_2.0.11_DLL_EXPERIMENTAL' description changed. LawrenceFB changed permissions for Simply Knock SKSE64 DLL: Author changed their file credits. LawrenceFB changed permissions for Simply Knock SKSE64 DLL: Author changed their file credits. ; Bug tracker set to locked.